Migrants have arrived in Tijuana and other border cities in caravans of thousands, while others come in small groups of a dozen or so. They have often walked for days through Central America, then ridden buses or gotten rides on trucks through the vast expanses of Mexico. In border cities like Tijuana, they find help in shelters run by charities. Asylum seeker Angela Escalante is here with her husband and 7-year-old son. “The situation is very bad, there are no jobs,” she said of her country of Nicaragua, blaming political violence there on President Daniel Ortega. “There’s no security so you can’t safely walk the streets,” she added. 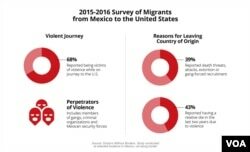 New arrivals say they also face violence from cartels and local drug gangs. “It was around 14 years ago they killed the brother of my grandfather and a son of my grandfather, and because of this, they are still pursuing us,” said Jorge Alejandro Valencia, 19, from Michoacan state on Mexico’s western coast. He said the criminals later killed his grandfather, and they now are threatening his sister. A 23-year-old Honduran, newly arrived in a shelter, said a gang demanded he sell drugs, and he could see no escape except to leave his country. He asked not be identified, saying that the gangs monitor Facebook and if his identity is revealed, the gang would target his family. Africans and Haitians, who relocated from their countries to Venezuela, and Central Americans from Central America’s northern triangle of El Salvador, Guatemala and Honduras, all wait in the city’s shelters. Every case is different, and many are complicated. A woman from Honduras has a 12-year-old son with U.S. citizenship and displays his passport. The boy, named Jimmy, was born in the United States but returned to Honduras with his mother when she was deported. A middle-aged man named Efren Galindo was born in Mexico and grew up in Texas. Two years ago, he was deported and nearly killed by Mexican drug cartels, he explained as he displayed scars on his back and shoulder. “I’ve been 46 years, [nearly] my whole life over there,” Galindo said, pointing northward to the United States. “I’m married to an American citizen. I have four American sons, an American daughter and 16 grand babies,” he added. Migrants from Venezuela, Cuba and Guatemala wait at bridge between Matamoros, Mexico and Brownsville, Texas for immigration officials to allow them to turn themselves in and ask for asylum in U.S., Nov. 12, 2018. To be granted asylum, petitioners must demonstrate a credible fear of persecution or torture, and show that they are not only fleeing poverty. Those who have been deported from the United States face added restrictions. Many having been barred from returning for five, 10, 20 years or more. The U.S. immigration system, meanwhile, is overwhelmed, with a backlog worsened by the recent 35 day partial shutdown of the U.S. government in a dispute between Democrats in Congress and U.S. President Donald Trump over a border wall. 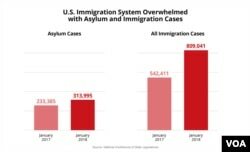 U.S. Immigration and Citizenship Services said in a statement Jan. 21 that it faced “a crisis-level backlog of 311,000” asylum cases that had yet to be interviewed for credible fear. The backlog of all immigration court cases was more than 800,000 in November, according researchers at Syracuse University. Many detention facilities that house illegal entrants are temporary, according to Border Patrol Agent Tekae Michael on the border south of San Diego. Mexico is granting temporary papers to Central Americans, and volunteers from U.S.-based groups like San Diego’s Border Angels bring supplies to the shelters. Mexican businesses are making donations. Carlos Yee of the Catholic shelter Casa del Migrante says aid workers like him feel frustrated. “We don’t have the power to work through this enormous bureaucracy. We only can say to them, be patient,” he said. The city of San Diego is visible through a border fence, just 30 kilometers north of here, but these migrants in Tijuana face many more hurdles on their journey. Yet, they are still hopeful.